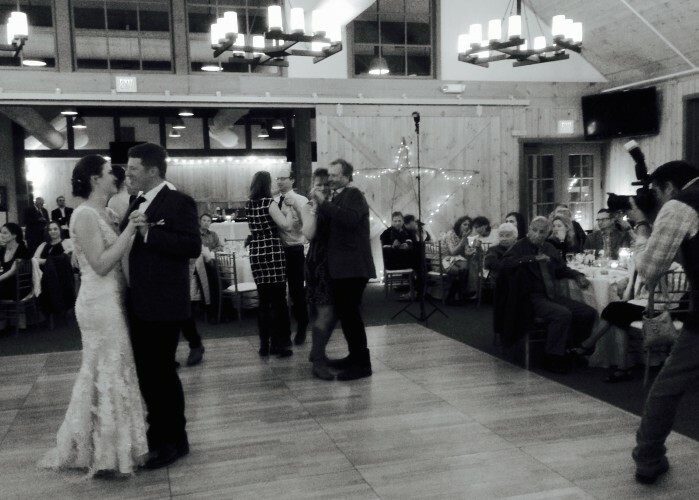 Homade Ski Arbor, bride in Ski Boots! 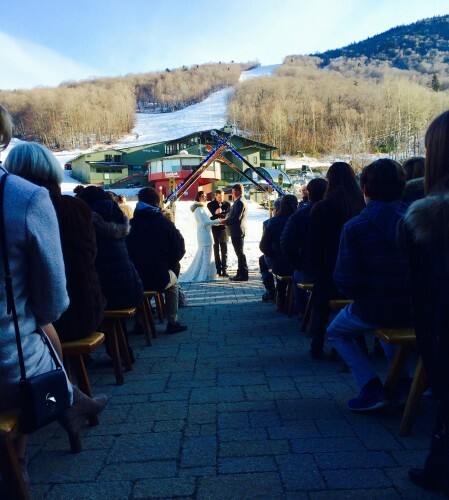 A gorgeous spring day for a ski-in wedding! The wedding party, Bride, and Dad skied in formation down to the ceremony just outside Sugarbush Gate House Lodge…a first for me and most of the guests. “Here Comes the Sun” was the processional song, as they skied down to the custom wedding Arbor made by old skis found at the homes and Green Mountain Valley School. Well done by all, the officiant was the Brides Uncle, all framed by a perfect sunset over Sugarbush Resort and Lincoln Peak. Photo of me taking a Photo of the Photographer during the first dance. 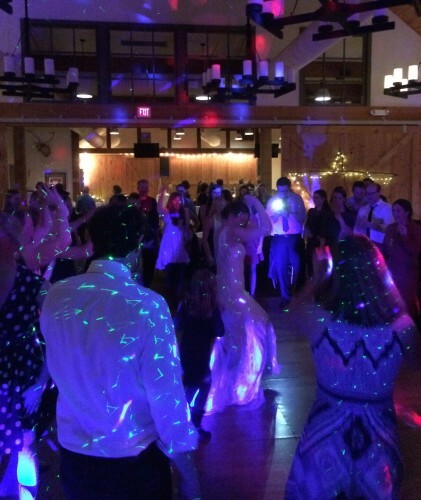 Its always an exiting time, and my pleasure to be your custom wedding DJ. The reception was tastefully decorated, country and elegant. Buffet dinner and as special surprise the Bride, Alta, made all the cakes on the cake table! Must have been 20 custom cakes, all different favorites from cheesecake, black forest, traditional yellow and chocolate frosting, white with white and chocolate on chocolate. Hard to pick a favorite with so much variety! Time for the Dance Party! And it was off with an energetic group, most guests were ski professionals and racing Pros, so the dance floor was packed with grooving and getting down! It was a perfect kick off for apqproductions as we embark on another busy wedding season for 2016. Contact me for availability and pricing quotes, most saturdays already booked but i’m specializing in Friday and Sunday DIY weddings, rentals, and lighting too. Custom weddings and playlists and crowd pleasing music is my passion and pleasure…call for consult of if you have any questions. Thanks Alta and Chris and Family for a wonderful time, and a memorable event indeed! ← New Review on WeddingWire!